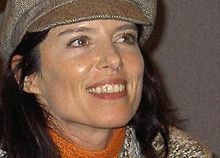 Sarah Victoria "Torri" Higginson is a Canadian actress. She is best known for her roles in the TekWar movies and series, and for portraying Dr. Elizabeth Weir in Stargate SG-1 and Stargate Atlantis (2004–2008), Dr. Jordan Hampton in NCIS (2007–2009), and Commander Delaney Truffault in Dark Matter (2015–2017). She is also a theatre actress and has appeared in Three Tall Women, Weldon Rising, and Picasso at the Lapin Agile. In 1995, two years prior to Stargate SG-1's premiere, Higginson starred in the movie Jungleground with three other actors from the Stargate franchise: Peter Williams (Apophis), JR Bourne (Martouf), and Lexa Doig (Dr. Lam). Higginson took over the role of Dr. Elizabeth Weir from Jessica Steen in a guest spot on the season eight opener of Stargate SG-1. She was then carried over as the leader of the Atlantis expedition on Stargate Atlantis and continued playing that role until the end of the show's third season, afterwards being reduced from a main cast member to a recurring role in the fourth season. She did not reprise the role for the show's fifth season. In 2015, Higginson was cast in the CBC television drama series This Life as Natalie Lawson, a lifestyle columnist and single mother who is diagnosed with terminal cancer. The series ran for two seasons, and was ultimately cancelled on January 24, 2017. In 2016, she portrayed Dr. Kessler on the KindaTV web series Inhuman Condition. Higginson won a Gemini Award for Best Performance by an Actress in a Continuing Leading Dramatic Role for The City in 2000. In 2004, she was nominated for a Saturn Award for Best Supporting Actress on Television for her performance in Stargate Atlantis. 1992 Forever Knight Erica episode "Last Act"
1993 E.N.G. Madeline Shannon episode "The Good Samaritan"
1994 Counterstrike Susan Kimberly episode "Clearcut"
1998 Highlander: The Raven Claudia Hoffman episode "Reborn"
1999 The Outer Limits Alyssa Selwyn episode "The Haven"
2001 Canada: A People's History episodes "From Sea to Sea" and "The Great Enterprise"
2002 Bliss Kate episode "Valentine's Day in Jail"
2008 Eleventh Hour Alex episode "Titans"
2011 Criminal Minds: Suspect Behavior Nurse Karen episode "See No Evil"
Chase Sandra episode "Father Figure"
^ Heffernan, Virginia (July 16, 2004). "Atlantis Mystery Is Solved; Now, About the Wormhole". The New York Times. Retrieved February 24, 2010. ^ "CBC announces new series and renewed titles for 2016-2017". CBC News. 31 March 2016. Retrieved 3 April 2016. ^ David, Greg (January 24, 2017). "This Life cancelled by CBC after two seasons". TV, eh?. Retrieved January 24, 2017. ^ "A bisexual therapist works with supernatural patients on "Inhuman Condition"". AfterEllen. July 15, 2016. Retrieved July 26, 2016. ^ Academy of Canadian Cinema and Television official site Archived 2008-02-19 at the Wayback Machine, retrieved February 14, 2008. ^ "31st Annual Saturn Award Nominations". Archived from the original on March 11, 2008. Retrieved February 24, 2010. Wikimedia Commons has media related to Torri Higginson. This page was last edited on 23 April 2019, at 00:39 (UTC).